The store at the corner of 34th and Pennsylvania as it looked in 1940. Russian immigrant Morris Greenman ran the store in 1910, selling food and other goods to new residents recently arrived from other countries. This recent Google map photo of the block shows the remaining buildings. Most of the property is owned by Kansas City Life Insurance and about half of the properties have been demolished since the 1940s photos were taken. As Kansas City neighborhoods filled up with residents after the turn of the 20th century, this block, like many others in Midtown, became home to many immigrants. In 1910, the residents of the area from Summit to Jefferson between 34th to 35th Streets came from Russia, Ireland, Denmark, Sweden, Germany and Canada, mixing in with other families who had recently moved to Kansas City from other parts of the United States. In fact, of 24 households on the block in 1910, at least 15 were headed by recent immigrants, and many other residents were first-generation Americans. That year, the homes and apartments there were newly-built and offered up for rent or sale to working families. In those 1910 census records, Morris Greenman and his wife Jennie lived at 3400 Jefferson, an address above a grocery store Greenman ran. Morris had immigrated from Shkuea, Russian with his father, mother, and six siblings in 1893 and his wife came to the United States the following year. A 1909-1950 Sanborn Fire Insurance map shows the homes, businesses and apartment on the block. Morris’ father Samuel Greenman established a clothing store at 1733 Grand (on a site that later became part of the Kansas City Star property). After Samuel’s wife died in 1905, he moved to Palestine where he was a part of the Zionist movement. 3426 Jefferson: John T. Duff, a saloon proprietor, his wife Helen, a son, a daughter and mother-in-law. John was born in Iowa and Helen in West Virginia; both sets of parents had been born in Ireland. 3430 Jefferson: Henry H. Hanson, a brewery driver, his wife, Georgia and boarder Meta Hopfner had all been born in Denmark. 3404 Jefferson: Howard Moffatt, a chauffeur for a private family, wife Nellie and brother William Moffatt. Nellie’s parents were born in Sweden. 3404 Jefferson: Joseph Nichanchy, a baker for a grocery company, and wife Rose. Joseph was born in Germany; Rose’s parents were born in Germany although she was born in Iowa. 714 W. 35th Street: Caleb Adams, a livestock manager, his wife Louise, daughter Cornelia, and a black servant named Bettie Blank. They had all been born in the United States. 708 W. 35th Street: Thomas Glynn, a packing house foreman, his wife Anna, three sons and two daughters. Thomas was born in Ireland and his wife’s parents had been born in Ireland. All of the children were born in the United States. 706 W. 35th Street: Hufsy Dye, a meat shop proprietor, wife Lula, a daughter, sister-in-law and father. All had been born in the United States but they had two boarders, S.C. Goodrich, a street railroad ticket agent born in Canada and his wife, Hannah, born in the United States to a French father and German mother. 704 W. 35th Street: Henry W. Guy, a locomotive engineer, wife Josephine, two sons and a sister-in-law. They had all be born on the east coast in New York, Massachusetts or New Hampshire. 708 W. 35th Street: Alphonse Follens, wife Mary, a son, a daughter and father. Follens’ father had been born in the United States to Irish parents. 712 W. 35th Street: Duane Parish, a photograph traveling salesman, wife Alice, and two daughters had all been born in the United States. Alice’s father was an English immigrant. 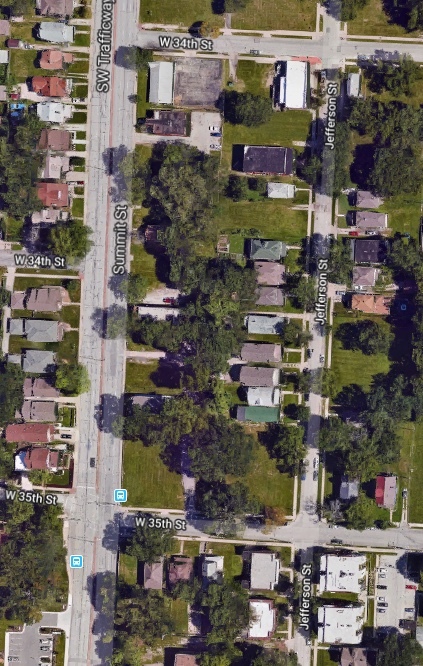 718 W. 35th Street: Henry Osailer? (the handwriting on census records is hard to decipher), a medical student, and his wife Carla were both born in Denmark. Their boarder E.H. Zeilinger had a German father. 3419 Summit: Bridget O’Rourke and four daughters. Bridget’s mother was born in Ireland. 3421 Summit: Charles Walters, a railroad company laborer, wife Elizabeth, and two sons. They had all come to the United States from Ireland in 1882. 3423 Summit: Mily Jarmin, a foundry moulder, a son, a daughter and a brother. Mily and his brother were both born in French Canada. 3417 Summit: J.E. Miller, a paper hanger, his wife Florence, two sons,and a great-aunt. They had all been born in the United States. 3433 Summit: John T. Wellington, a coal company dealer, wife Mary, a niece, and a white servant named Anna Fitzpatrick whose parents were born in Ireland. 3437 Summit: Hannah Tobin, born in the United States to Irish parents, two daughters and a son. 3439 Summit: Charles Thomas, who worked for a locomotive company, wife Lizzie and two daughters, all born in the United States. 3441 Summit: John C. McGeury, a distillery agent, wife Mable and a daughter. John’s father was from Ireland. 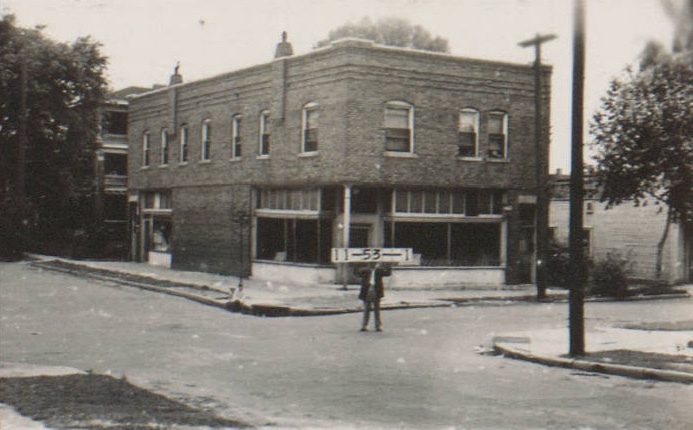 The slideshow below shows the buildings on the block as they looked in 1940. Hi… this looks like it could be Brown’s market, but I could be mistaken? Happy Thanksgiving all ! This is a question about Sidney’s Diner locations in Midtown. I have seen an old add on a FB page that shows a location address of 1111 Linwood. This is at the intersection of Troost and Linwood. I lived in that neighborhood in the 50’s and for the life of me I cannot remember a Sidney’s anywhere near that location. Perhaps others can fill in my blanks.